Targus 12" Grid Essentials Slipcase Notebook carrying caseWrap your laptop in tough protection with the 12" Grid Essentials Vertical Slipcase. It has a rigid cage design that you slip your laptop into, with extra-thick foam padding to boot. It even has metal hardware to stand up to a student's daily trek to and from class. Students can pack their chargers, pens, and pencils in the large front pocket for accessories. And its extra-large ID card holder is the perfect place for a student ID, and allows a student to add their own personality to customize as they see fit. Carry your device via a large handle or throw it over your shoulder with a removable shoulder strap. Wrap your laptop in tough protection with the 12" Grid Essentials Vertical Slipcase. It has a rigid cage design that you slip your laptop into, with extra-thick foam padding to boot. It even has metal hardware to stand up to a student's daily trek to and from class. Students can pack their chargers, pens, and pencils in the large front pocket for accessories. And its extra-large ID card holder is the perfect place for a student ID, and allows a student to add their own personality to customize as they see fit. 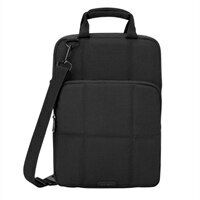 Carry your device via a large handle or throw it over your shoulder with a removable shoulder strap.